High Tech Race Weapon An exhilarating, high-revving power delivery and a lightweight and agile chassis, make the FC 250 a true contender in 250 4-stroke racing at all levels worldwide. The 14,000 rpm rev limit and peak power at well over 40 horsepower are benchmark performance figures. High quality standard equipment includes electric start, a hydraulic clutch, Brembo brakes and a handlebar-mounted map switch. Handlebar - New Neken handlebar, with the same bend as the previous model year, with Husqvarna bar pad mated to Husqvarna grips for excellent control of the bike. Fork Protectors - The distinctive Yellow fork protectors have been redesigned and no longer wrap around the fork leg. The new design allows for improved access to the fork leg for better maintenance and cleaning, while also being easier to replace. Brakes - Exceptional stopping power is guaranteed by the latest generation Brembo brakes, featuring floating calipers in combination with 260 mm wave discs at the front and 220 mm wave discs at the rear. The perfectly placed controls allow for optimal feel and balance under extreme conditions. Seat - The seat features a new seat cover material that improves grip and durability. The sturdy material is also harder than the previous cover, making the entire seat firmer, improving comfort and feeling. Engine Management System - The electronic fuel injection and 44 mm throttle body of the Keihin Engine Management System on the 4-stroke models, combine to offer amazing power delivery and efficiency at all engine speeDual Sport. The injector was positioned on the bottom of the inlet tract for optimal air-fuel mixture, resulting in crisp throttle response and class-leading power. Great attention was dedicated to ensuring that cleaning and washing the bike will not damage the electronics. The wire harness, lead wire, and high quality sealed critical connectors ensure that a jet wash poses no threat. The throttle position sensor (TPS) is also water resistant and protected. Engine - Technologically advanced solutions in engine layout and components ensure explosive engine performance. The lightweight and compact DOHC 4-stroke engine has been designed to offer top performance without compromise. The large titanium valves (32.5 mm intake and 26.5 mm exhaust) weigh only 0.69 oz. (19.6 g) each on the intake side and 0.63 oz. (18 g) on the exhaust side. DLC coated finger followers and cam shafts designed for top performance also contribute to the extreme power delivery of the 250cc engine. The handlebar mounted map switch is a standard feature and allows the rider to switch between maps while riding, adjusting power delivery and engine performance according to rider fatigue and track conditions. Crankshaft, Conrod and Piston - The high revving 250cc engine demanDual Sport high-tech and reliable engine components. The crankshaft features a plain big end bearing and force-fitted bearing shells, ensuring durability and long service intervals. The conrod and crankshaft are produced by industry leader Pankl to exacting standarDual Sport. The piston is produced by König and has been designed for minimum weight to suit the high-revving, high output nature of the FC 250. The forged box-type piston weighs only 7.1 oz. (200 g) and combines high performance and reliability, and guarantees a compression ratio of 13.9:1 for maximum power output. Starter - All 4-strokes feature a reliable electric-start-only system. The electric starter is a great advantage in every situation, especially in the event of a fall or in a difficult location on track. The increase in weight has been kept to a minimum by eliminating the mounting and components of the kick-starter. Engine - Technologically advanced solutions in engine layout and components ensure explosive engine performance. The lightweight and compact DOHC 4-stroke engine has been designed to offer top performance without compromise. The large titanium valves (32.5 mm intake and 26.5 mm exhaust) weigh only 19.6 g each on the intake side and 18 g on the exhaust side. DLC coated finger followers and cam shafts designed for top performance also contribute to the extreme power delivery of the 250cc engine. The handlebar mounted map switch is a standard feature and allows the rider to switch between maps while riding, adjusting power delivery and engine performance according to rider fatigue and track conditions. Crankshaft, Conrod and Piston - The high revving 250cc engine demanDual Sport high-tech and reliable engine components. The crankshaft features a plain big end bearing and force-fitted bearing shells, ensuring durability and long service intervals. The conrod and crankshaft are produced by industry leader Pankl to exacting standarDual Sport. The piston is produced by König and has been designed for minimum weight to suit the high-revving, high output nature of the FC 250. The forged box-type piston weighs only 200 g and combines high performance and reliability, and guarantees a compression ratio of 13.9:1 for maximum power output. Frame - The engineers in Research and Development had clear objectives in terms of torsional rigidity, longitudinal stiffness and weight. The goal was to give the rider optimal feedback and complete confidence in every situation. This was achieved by designing the lightweight chromium molybdenum frame with precise longitudinal flex that helps ABSorb impacts from the rear wheel, working together with the suspension for better comfort and greater feedback. 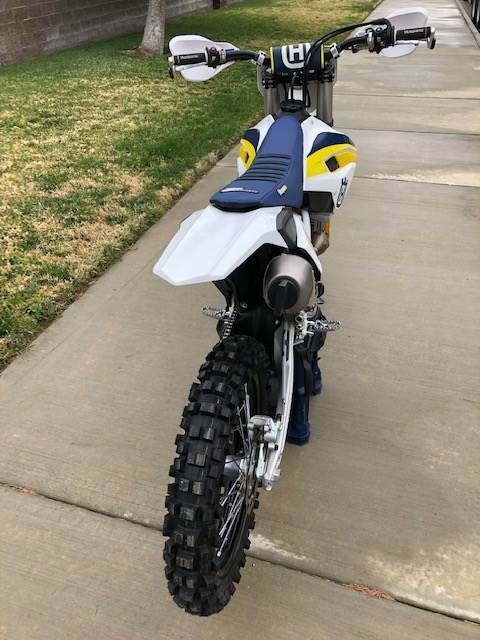 The torsional rigidity enhances turn-in, sharp handling and stability even on the roughest terrain, giving the rider complete confidence in finding his lines and increasing his pace lap after lap. WP Performance Systems produces every frame to exacting standarDual Sport in an ultra-advanced production plant. The production process involves hydro-forming and robot welding for maximum precision and consistent quality that is reflected in the supreme performance of every Husqvarna motorcycle. Subframe - The lightweight polyamide rear subframe has been reinforced with an additional screw on the airbox side that improves the fitment between the left subframe arm and the airbox. The improved seal guarantees better performance and durability. The 3-piece composite subframe, made of high strength polyamide with a precision injection molded production process, has been designed to offer stiffness while flexing more than an aluminum subframe, complementing the flex characteristics of the frame in order to offer optimum rider feedback and feeling in all conditions. The lightweight design offers engineers unlimited opportunities in integrating features such as all the electronics and the airbox. Swingarm - The single component construction of the aluminum swingarm eliminates welding, providing more reliability, stability and safety, as well as superior quality and consistent behavior over time compared to other construction processes. 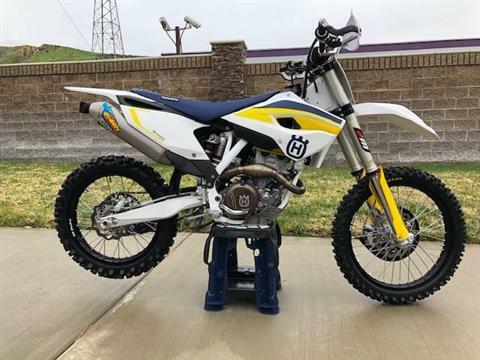 The specific flex engineered into the swingarm makes the most of the Husqvarna engine characteristics in terms of traction and power. 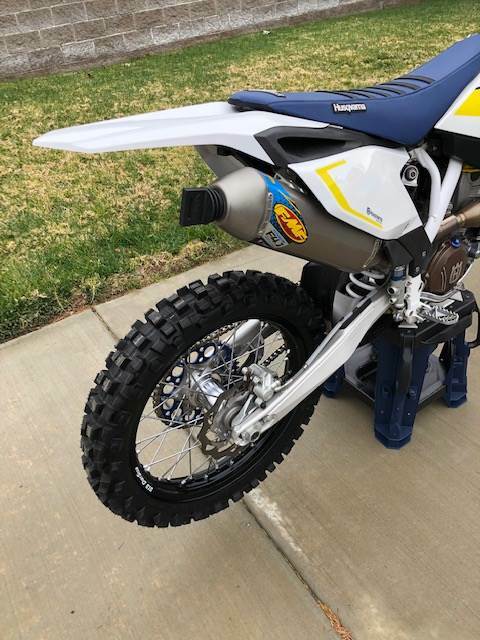 Tires - The lightweight wheels are complemented by new Dunlop MX52 Motocross tires that feature a new “block-within-a-block” design for more progressive cornering. The new Dunlop rubber has been developed to offer superior grip in a wider variety of terrain. Front Suspension - WP has developed a closed cartridge 4CS fork specifically for Motocross. The new 4-chamber fork has improved damping characteristics and is also lighter than the previous closed cartridge fork. As with all 4CS forks by WP, the clicker settings can be easily and quickly adjusted via the dials on the top of the fork tubes. The Red dial on the right alters rebound damping, while the White dial on the left is for compression damping. WP suspension stanDual Sport for top quality and offers the best performance levels. Precision engineering, quality materials and advanced production processes are an integral part of the WP forks on the Husqvarna model range. 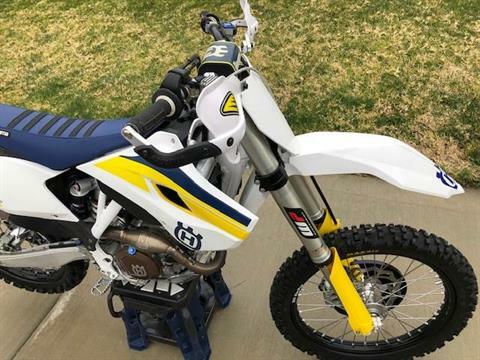 Rear Shock - The high performance Husqvarna DCC (Dual Compression Control) rear shock made by WP has a revised setup and has been re-valved to match the geometry changes of the new rear link. The new shock features a 4 mm increase in stroke thanks to the new link geometry, for better handling and damping characteristics. Rear Link - The rear link has been revised and now features a higher starting rate, and therefore a less progressive curve, that provides better control in all circumstances. Further advancements in production processes have seen an improvement in quality and a reduction in weight of the triangle and pull rod of approximately 1.4 oz. (40 g). 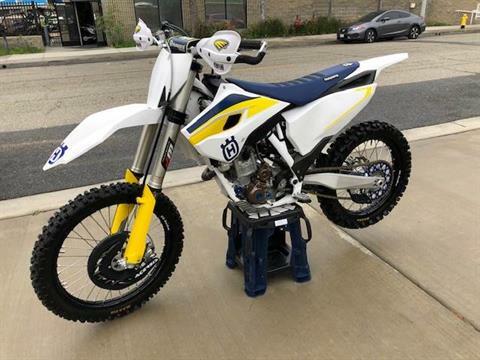 22 mm Front Axle - In the overall optimization of the chassis, the MY15 Motocross bikes feature a new 22 mm front axle with specific fork shoes in place of the previous 26 mm axle. The new axle is lighter, and the shoes have shorter offset and increased trail, for more stability and better front-end feel. Rear Link - The rear link has been revised and now features a higher starting rate, and therefore a less progressive curve, that provides better control in all circumstances. Further advancements in production processes have seen an improvement in quality and a reduction in weight of the triangle and pull rod of approximately 40 g.